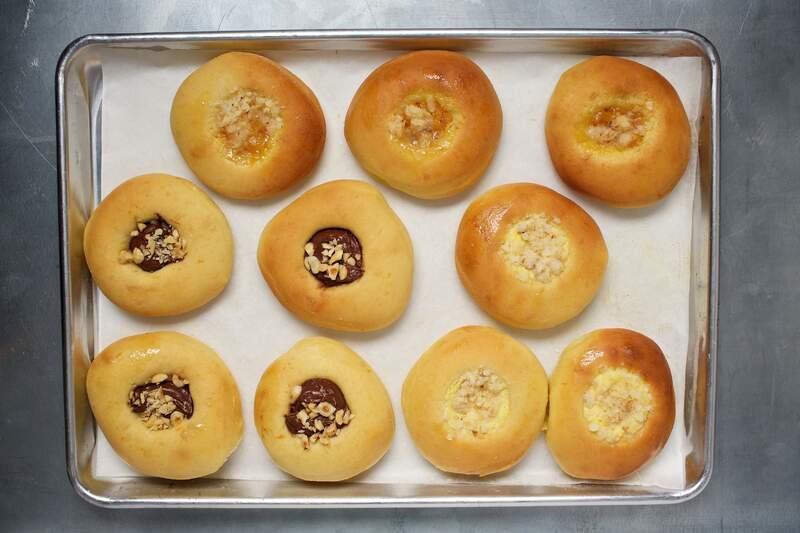 Sweet kolaches filled with Nutella and crushed hazelnuts; with apricot streusel; and with cheese streusel. 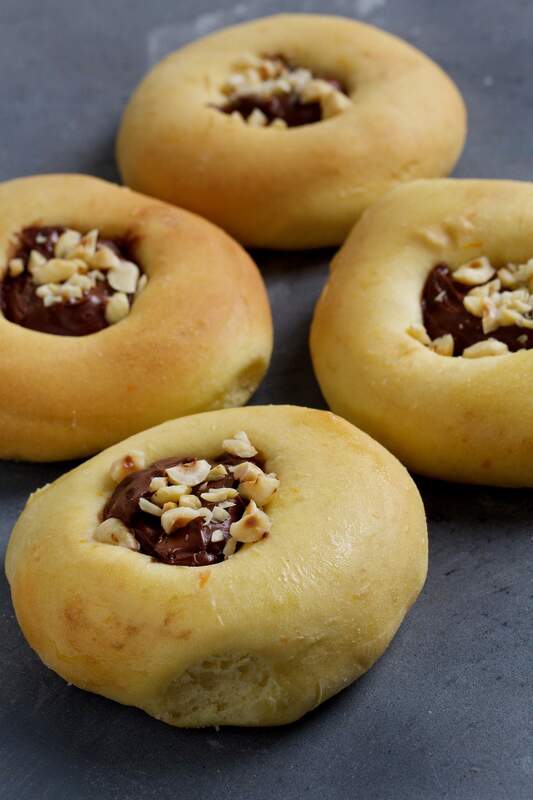 Kolaches with Nutella and crushed hazelnuts. Kolaches are Czech-born, Texas-favorite soft rolls with a satisfyingly sunken patch of filling. Ask almost anyone from the Lone Star State whether they know about kolache (co-LAHCH) and be prepared for a promotional treatise. Nebraska, Minnesota and Wisconsin stake their own kolache claims, and I would venture to say anyone who has ever tasted the pastries has something to say about them. I realize that baking with yeast is time-consuming and a challenge for some, but the payoff is handsome. Yeast comes to life with sugar and flour, warmth and time, yielding bounce and lift. It’s quite glorious, so be courageous. Kolaches taste best when they are fresh. Set aside a couple of hours (although there’s one inactive hour in there) to make my kolache recipe. After proofing the yeast in warm water and watching for telltale signs – a few little bubbles – the stand mixer and dough hook do all the work. But if there is not a stand mixer in your kitchen arsenal, this is a pleasant dough to stir together and then knead by hand. Initially, I tried forming kolaches as I might make a dinner roll, in a tight little ball, then pressed down to form a plump disk. This did not work well; the kolache returned to a rounded shape, transforming the filling into a topknot. Better method: I pressed the dough out and stamped out each kolache with a large cookie cutter, and then, with a flat-bottomed glass a little smaller than the cutter, pressed a deep, generous well into the center of each disk. The dough held this shape through the second rise. I had to learn not to be shy about that indent – to press down with force. Once all were pressed, I let the bagel-size portions of dough rise for just 15 minutes. Not one minute more. This is not the time to get distracted; a lively dough such as this can easily over-proof; here, this means the dough will rise and collapse on itself in the oven, or will rise up too far and split, pushing the filling out of its trench. 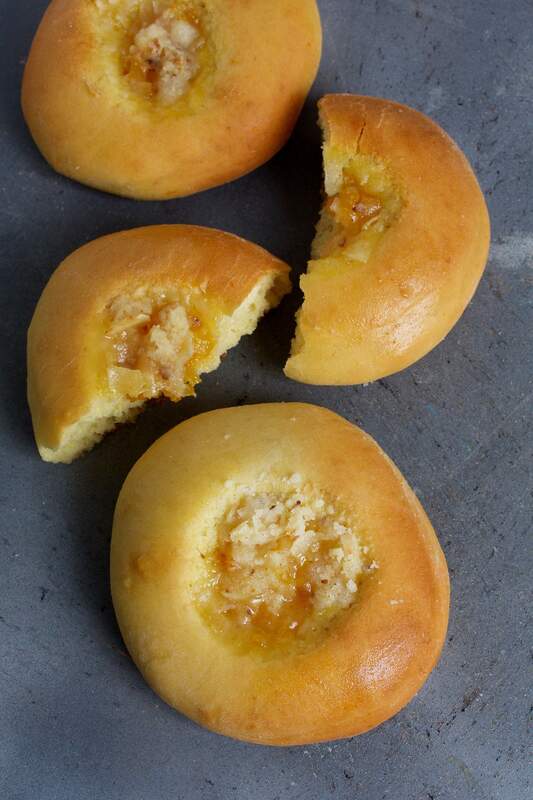 Consider the fillings an excuse to make your own personal kolache. A little cheese topped with a spoonful of apricot and showered with coconut streusel? Yes, please. Or choose to use just one filling. This time. You’ll make more, I just know it. These are addictively delicious treats, and, really, a lot of fun to make. Whether kolaches hail from Moravia, Czechoslovakia or Poland, or whether they became something unique when they traveled to Texas, Wisconsin or Minnesota, I really can’t say. Texans often make their kolaches in a deep, small baking pan so the rolls must be pulled apart, like cozy homemade cinnamon rolls. Nebraskans claim never to allow their kolache to touch. A Czech recipe shows kolache dough pressed into a large round, divided into eight sections, each with a different filling. There is a whole world of kolache. Start here and warm up your next gathering with these treats. Along the way, you’ll get to know a silky, scented, friendly yeast dough with a wide range of possibilities. A flat utensil called a bench scraper is helpful for handling the dough on the counter. You’ll need a 4-inch round biscuit cutter. MAKE AHEAD: The dough needs to rise two times, for a total of a little more than 1¼ hours, at room temperature. Or allow the first proof to happen in the refrigerator, for up to 16 hours. These rolls are best served straight from the oven. If you wish to enjoy them a few hours later, wrap each one tightly in foil; reheat them for 5 minutes in a 350-degree oven. Or freeze the buns (wrapped) after they have cooled completely, then reheat them, frozen and unwrapped, in a 350-degree oven for 8 to 12 minutes. Ingredients:For the apricot filling:3 ounces dried apricots (about 6), finely minced1/3 cup water1/3 cup sugar2 tablespoons fresh orange juice, warmedFor the cheese filling:1/2 cup whole-milk ricotta cheese, drained for 1 hour (may substitute farmers cheese; see headnote)4 tablespoons (1/4 cup) cream cheese3 tablespoons sugar1 large egg yolkFor the coconut streusel:1/4 cup flour1/4 cup sugar1/4 cup toasted shredded coconut, finely chopped2 tablespoons unsalted butter, at room temperatureFor Nutella kolaches:1/2 cup Nutella or other chocolate hazelnut spread1/4 cup toasted skinned hazelnuts, finely choppedFor the dough:2 1/4 teaspoons (1 packet) active dry yeast1/4 cup lukewarm water1 cup whole milk4 tablespoons (1/2 stick) unsalted butter1/2 cup sugar2 large eggs1 teaspoon finely grated orange zest1 teaspoon kosher salt5 cups flour, plus more for kneading and shaping2 tablespoons unsalted butter, meltedMethod:Stir the yeast into the warm water in a bowl. If after a few minutes there are no bubbles on the surface, discard the mixture and remake it before continuing. Warm the milk and butter in a small saucepan (or the microwave) until the butter has melted, remove from the heat and cool slightly. Do not allow this mixture to boil. Whisk together the sugar, eggs and orange zest in the bowl of a stand mixer fitted with a dough hook. Add the salt, flour, the milk-butter mixture and the yeast mixture. Beat/knead on medium speed for 7 to 10 minutes, until long strands are forming on the sides of the bowl and the dough is smooth and dotted with bubbles. It will be sticky and will not form a ball, but it will start to pull away from the sides of the bowl. Use cooking oil spray to lightly grease a large bowl. Lightly flour the work surface. Scrape the dough onto the work surface and lightly flour the surface of the dough. Use a bench scraper to lift and fold the dough, turning, lifting and folding again a few times until it forms a smooth ball. Place in the prepared bowl and cover with plastic wrap. Place in a warm, draft-free place until doubled in size, about 1 hour. For a long, slow rise, place the bowl in the refrigerator for up to 16 hours. Generously flour the work surface. Scrape the dough onto the work surface and press down firmly to deflate the dough. Pat the dough out to a rectangle 16 by 12 inches. Use a 4-inch round cutter or a glass of the same size to stamp out 12 rounds. There should be very little dough remaining. Each round, about the size of a plump silver dollar pancake, should weigh around 95 grams. Place each round on the baking sheet, spacing them about 1 inch apart. Press a deep well into each kolache with the flat bottom of a glass or a small jar. Press hard as the dough is springy and will want to fight back. (You may also use your well-floured fingertips to tease out a wide well for the filling.) Cover snugly with plastic wrap, and place in a warm, draft-free place until puffy, about 15 minutes. Use the same flat-bottomed glass or jar to firmly press down the center of each kolache once more, then place 2 heaping teaspoons of filling (apricot, cheese, half apricot and half cheese, or Nutella) in the indentation. Repeat until all the kolaches are filled, then sprinkle on the coconut streusel or chopped hazelnuts, if using. Transfer the baking sheet to oven; bake (middle rack) for 25 to 30 minutes, until golden brown. As soon as you take them from the oven, brush the kolaches with melted butter. Serve right away, while still warm, or cool completely and follow the MAKE AHEAD directions in the headnote. Source: From cookbook author Cathy Barrow.